When my son was first diagnosed with autism, we had already made the decision to homeschool. From my perspective, knowing his diagnosis affirmed our decision to educate my son at home. It explained his constant meltdowns in the morning. It gave me a sense of how difficult navigating the public school environment must have been for him. But in the haze of appointments and therapies, I remember being asked the same type of question, over and over again – “Can you homeschool a child with special needs?” or “Will you have to put him back in school now that he had a diagnosis?” No matter how confident I felt about our decision, the reality is that many well-meaning professionals have no idea what it means to homeschool a child. Most are not aware of state laws and accommodations. The majority of families they see are in traditional school environments. Thus, the near constant questioning. It was overwhelming and honestly, pretty terrifying. Can You Really Homeschool A Child With Special Needs? Nine years later, I can say with 100% certainty, the answer is yes. Although I had no way of knowing it at the time, our decision to homeschool has been one of the best we’ve made for my children with special needs. I want to share the greatest benefits we have experienced, but before I do, want to address some of the common misconceptions of homeschooling kids with special needs. Although state laws vary in terms of requirements, it is legal to homeschool children with special needs in all 50 states. I went to school to be a special education teacher. Please, let me assure you, I did not learn anything more than the very basics, and I had to learn those basics for a large number of diagnoses and needs. Most of my education centered around classroom and group behavior management – something that is not a concern at home. The truth is, you can and will fast become the expert on your child’s diagnoses, learning style, and needs. 3. You need special qualifications and diplomas. Again, every state has different qualifications and requirements for homeschool teacher education. 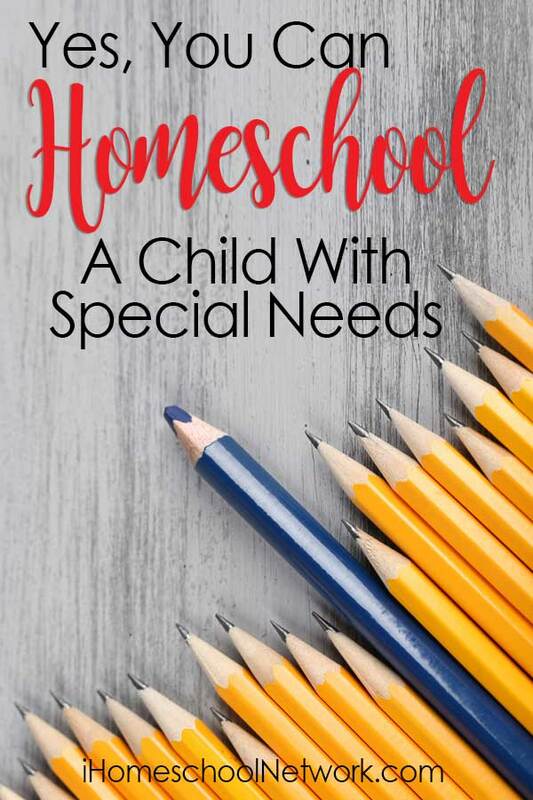 Beyond any formal education requirements, I want to assure you that there are a vast number of resources available to help parents learn strategies for successfully homeschooling a child with special needs. What has surprised me most since we first began our homeschooling journey, is just how appropriate learning at home is for my children with special needs. Here are just a few of the benefits we have experienced. The greatest impact we have seen is in how much my sons have been able to maintain a positive self-image and confidence in their own ability to learn. Because they are not constantly compared to their peers, they are able to progress at their own pace. I find this to be invaluable as my boys mature into men. Homeschooling also allows us to focus on our children’s strengths, rather than having them feel a constant focus on the areas that are most difficult for them. When I was student teaching, I left the school every day overwhelmed and honestly, sad. There were 11 children in my classroom, all with varying needs and diagnoses. I remember thinking, “If I could just spend some time with each of them one on one, I think I could really help them make progress.” Unfortunately, a special education classroom provides limited opportunities for one and one attention and learning. Exactly the opposite is true at home. I can tailor learning as needed, based on my individual son’s needs. For example, my youngest son is profoundly dyslexic and learns best in hands-on, tactile ways. I take his reading practice outside and we jump from sight word to sight word in a hopscotch square for practice. This allows him to retain more than the standard approach a traditional classroom is forced to take. My son fought me every single morning for two school years. Seriously, every single morning. Add homework demands and the constant emails and paperwork from the school, and what we had was a very stressed out family dynamic. Homeschooling has decreased the stress substantially in our home. Although I do feel the increased pressure of being solely responsible for my sons’ learning, the truth is, life is much more enjoyable and relaxed than it ever was when we were in school. If you are considering homeschooling your child with special needs, please let me assure you, homeschooling is a viable and beneficial educational option. If you already are homeschooling a child with special needs, I want you to know your hard work matters. In my experience, the benefits far outweigh any other option we have considered.